Korg's first venture into analogue synth territory for nearly three decades. Forget about its weaknesses. At such a low price it's impossible to resist its many charms. Single oscillator synth with LFO and low-pass filter. Ribbon controller keyboard. Auxiliary input for processing external sounds. Too small and fiddly to achieve proper melodies. Noisy speaker/output. Can this tiny box live up to the hype? An analogue Korg synth - it's been a while. Though noisy, the output surpasses the built-in speaker. The benefits more than outweigh the flaws. Since the late 1980s, analogue technology has simply not been on the agenda for the Japanese hardware giants. Content to let other manufacturers fight for the retro market, Korg have focused instead on developing digital technology with the occasional nod towards their past in the form of analogue modelling synths and software recreations. Synth fans clamour for modern versions of past favourites, but the results (which include the likes of Korg's MS2000 and Roland's SH-201) have never quite recaptured the magic of the classics. Korg, whose vintage machines continue to rise in value on the second-hand market, have finally offered a hint that a new analogue range might still be an option. The Monotron, a bare-bones monosynth, is their first fully analogue product for nearly three decades. "The ace up Monotron's sleeve is its ability to process external sounds via auxiliary input." As far as we can remember, Korg's last truly analogue synth was 1982's Trident mkII - everything which followed used digitally controlled oscillators. Needless to say, we were pretty keen to see whether Korg still have what it takes to build a classic analogue synth. Even though we knew it was going to be small, it's almost impossible not to be surprised by the size of the Monotron. This is truly a palm-sized synth, powered by a supplied pair of AAA batteries and with a miniscule built-in speaker. The Monotron's synth architecture is admittedly very basic, but the limited features mean that it couldn't really be any simpler to play and tweak. The single oscillator, filter and LFO make it easy to get started creating weird and wonderful analogue sounds. The biggest problem when trying to play melodies on the Monotron is the keyboard. You'll need the dexterity of a brain surgeon and tiny fingers if you want to hit perfect notes on the ribbon controller. We're sure it's possible to develop precision with practice, but trying to play melodies is a lot easier said than done. If you're worried about precise tuning you're looking in the wrong place. We honestly couldn't tell you whether the oscillator's tuning was stable thanks to the imprecision of the ribbon. The pitch control isn't really intended for fine tuning - it's primarily used for setting the keyboard's range. We found that using a stylus (not supplied) made things a little easier, but even so it's not easy to pick out melodies. The simplest way to get interesting patterns out of the Monotron is to use the low frequency oscillator. Like the oscillator, the LFO can only produce an inverted sawtooth wave, which can be used to modulate oscillator pitch or filter cutoff. The LFO re-triggers each time you touch the ribbon, but unfortunately it can't be routed to pitch and cutoff at the same time, and the absence of a VCA means that tremolo effects are out of the question. Even so, it's highly effective for creating rhythmic filter patterns and cool warbling vibrato sounds. With the LFO speed cranked right up, audio rate modulation of pitch and filter cutoff produces intensely vicious timbres which belie the size of the Monotron. It might be asking a bit much in this price range, but the ability to sync to a tap tempo input would be a massive improvement to the LFO, allowing you to integrate the LFO pattern with your tracks. Square wave and regular sawtooth shapes would also make the LFO more versatile and in fact, while we're at it, why not add a square wave to the VCO? Perhaps we'll see these features on the inevitable Monotron Pro? The only significant problem with the Monotron's sound is a persistent hiss emanating from the speaker. The headphone output allows you to plug it into a better monitoring setup and the internal speaker is automatically muted when you insert a jack into the socket but the hiss is also present in this signal. It's a real shame, because the sound is otherwise incredibly good for such a tiny device. Without doubt, the most exciting element of the Monotron is the filter, said to be "the same highly acclaimed VCF circuit as the MS-10 and MS-20." The MS synths were famed for their viciously aggressive 12dB/octave low-pass filters, which howled and wailed with ease and could be provoked into self-oscillation by cranking the Peak control. Korg nerds will tell you that there were a number of slightly different versions of the MS filter - most notably, the earlier (and arguably more desirable) versions were based around a proprietary Korg-35 filter chip, whereas later MS-20 models used more widely available op-amps. The Monotron's VCF appears to be based around a recreation of the Korg-35 circuit, and there's no doubt that it captures the spirit of the MS sound. Lined up alongside my MS-10, it's clear that the two LPFs have a lot in common. Running the Monotron's oscillator through the MS filter and vice versa, similar sounds are easily achieved with any combination. The Monotron filter might not sound exactly the same, but it certainly captures the spirit of the MS. The real ace up the Monotron's sleeve is its ability to process external sounds via the auxiliary input. MS filter clones cost at least twice as much as the Monotron, so it's by far the cheapest option if you want a taste of that analogue filter magic. The good news is it's definitely not a poor man's version. The results to be had from processing external sounds are outstanding, although the lack of an envelope follower or CV control mean that you'll need to grab hold of the knobs to add your own variations. The LFO can still be used to modulate the filter when processing an external source, so it's really not a problem. When we first saw the Monotron, we were certainly excited to see if it could live up to our expectations. Most importantly, we desperately wanted the filter to sound good and for it to be a faithful recreation of the classic MS filter sound. The Monotron delivers on that front, and at this price point there really can't be too many complaints about the sound. 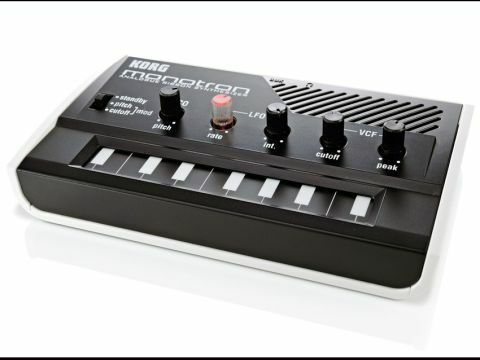 The bigger question is whether the diminutive form factor and imprecise ribbon keyboard make it possible to use the Monotron for serious music-making rather than just as a fun toy. The lack of precise pitch control means the Monotron lends itself better to sounds that don't need to be pitch-perfect, and I suspect its most obvious use in the studio will be for special effects. Filter sweeps, glides and rhythmic LFO modulation tend to produce the best results from the Monotron and we also got some nice effects by feeding various sources into the auxiliary input and manipulating them. The currently trendy filtered white noise takes on some great textures with the addition of LFO filter cutoff modulation and manual manipulation of the cutoff and peak knobs, while audio rate LFO modulation of the filter is particularly good fun. It's certainly a useful tool to have around, although we doubt we'd end up trying to use the keyboard very much. There's no ignoring the fact that the Monotron has a number of weaknesses. It's fiddly, there's no external control, the output's noisy and it's difficult to play in tune. But despite those issues, we still like it a lot and think the benefits more than outweigh the minor flaws. Once you look past the limitations and remind yourself that this is a true analogue synth for a bargain price, the Monotron is a real winner. It's certainly not perfect, but it's an inspiring piece of equipment to have kicking around the studio and it sounds good enough to use it on a track. When it comes down to it, the Monotron is a toy rather than a synth, but we really wouldn't be surprised if the Monotron made it onto quite a few records in the near future. If this really is the first sign that Korg are going to return to building analogue synths then we say bring it on.